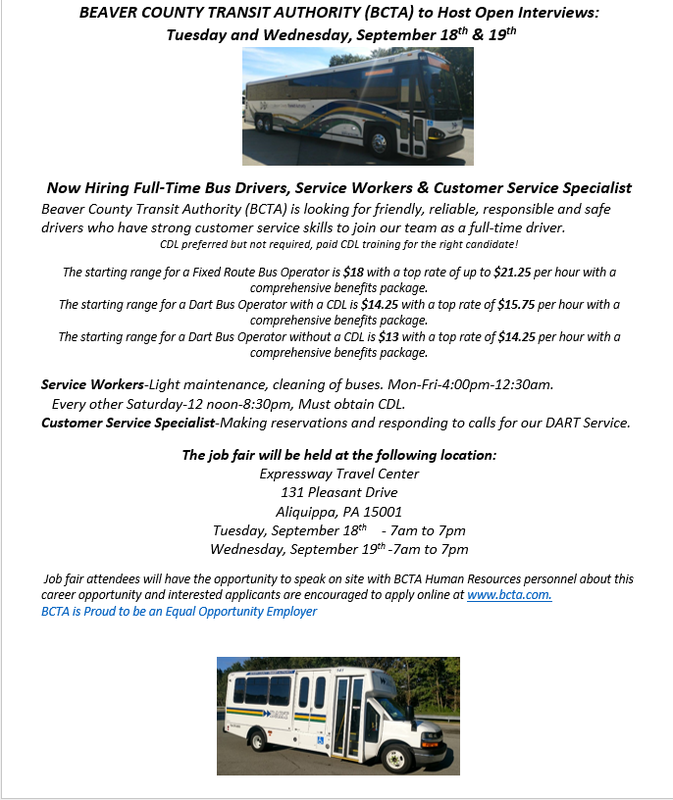 Beaver County Transit Authority (BCTA) is looking for friendly, reliable, responsible and safe drivers who have strong customer service skills to join our team as a full-time driver. CDL preferred but not required, paid CDL training for the right candidate! 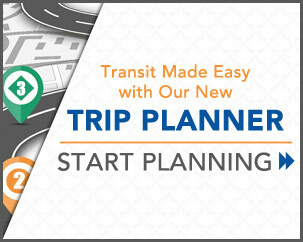 The starting range for a Fixed Route Bus Operator is $18 with a top rate of up to $21.25 per hour with a comprehensive benefits package. The starting range for a Dart Bus Operator with a CDL is $14.25 with a top rate of $15.75 per hour with a comprehensive benefits package. The starting range for a Dart Bus Operator without a CDL is $13 with a top rate of $14.25 per hour with a comprehensive benefits package. Service Workers-Light maintenance, cleaning of buses. Mon-Fri-4:00pm-12:30am. Every other Saturday-12 noon-8:30pm, Must obtain CDL. 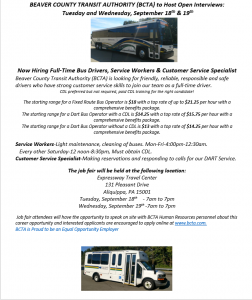 Customer Service Specialist-Making reservations and responding to calls for our DART Service. Job fair attendees will have the opportunity to speak on site with BCTA Human Resources personnel about this career opportunity and interested applicants are encouraged to apply online at www.bcta.com.